If I'm not wrong, the girl shown in the picture below is called 'majorette', a girl who entertains the audience at football games with their spectacular performances, or something similar. I don't know. However, what are the things indicated by the red arrows called? I try to search something, but I didn't have luck. I think they're called pom poms. That's not a majorette, that's a cheerleader. There's a difference. I shall not explain, but see Wikipedia on this. 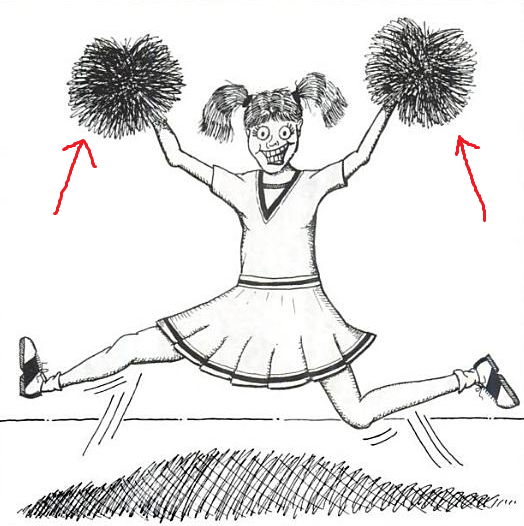 The main difference is the pom poms that the girl in the drawing is holding. That's what those are called (pom po*n*s? what are you people smoking?). Yes, I'm late with this answer, but I had to do something about the majorette thing. I can't help commenting further that "majorette" is the feminine version of the title "drum major", which refers to a man (or these days a woman, too) who leads a marching band. The majorette provides not direction but entertainment, twirling devices similar to that which a major uses to help convey signals. These are called "Cheer Pompons". What is the best word that defines the space shown in this picture? Does the game shown in the following picture have a particular name? What is the name of the truck shown in this picture? Is there a word or term to describe when someone focuses on a specific example, rather than the problem at large?